An ultra limited first run of a new brand from Aixsinthe. Apparently only 30 bottles were made available for purchase. Appearance: a light peridot green with hints of hay. Bright and attractive. No sediment. Judiciously colored. Louche: Slightly thin, but with a slow, ice-cold drip, I coaxed out an attractive, if not quite opalescent, louche. Attractive milky green color. Aroma: while there are a number of experts out there who will state until they are blue in the face that you can't tell what base alcohol is used, I'll go on record saying that this wine base stands out. Lots of character. Fresh and bright herbal aromas. Flavor/Mouthfeel: Well balanced and herbacious.Floral and 'juicy frooty'. 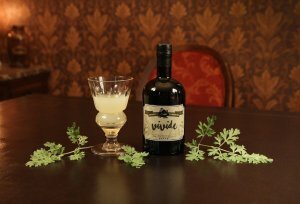 The wormwood pops nicely, but I'd like to see a bit more anise and fennel, which would round it out a bit. It would help with the thickness of the louche as well. But don't mistake, this is a VERY good absinthe. I'm picking nits here. The mouthfeel could be a bit more luscious, but that again is a factor of the anise. Finish: dry and herbal. It recedes neither slowly nor quickly. Definitely an easy drinker. Overall: Not as naturally sweet as many of the top tier absinthes, but not bitter either. This can most certainly hold its own against many of the top brands out there, especially if you like more of an herbal and less sweet style. Unless I'm missing something, this is easily the best brand coming out of Germany. When the next batch is available, you should pick up a bottle. I'm glad I was able to buy two.